5 Need help with installation? If you are having issues with the installation of Maps Marker Pro, please get in contact – we will be glad to help! Option B: if you want to start a free 30 day trial by getting a personalized license key, please enter your first name, last name, email address and press the button “Start personlized free 30-day trial period”. Your trial will expire automatically unless you purchase a valid pro license key. Option C: if you want to start a free 30 day trial by getting an anonymous license key, please click on “click here for more information” and then press the button “Start anonymous free 30-day trial period”. Please note that a free 30-day trial period can only be started once per domain! You will also not be able to open support tickets or get an information when your license has expired. 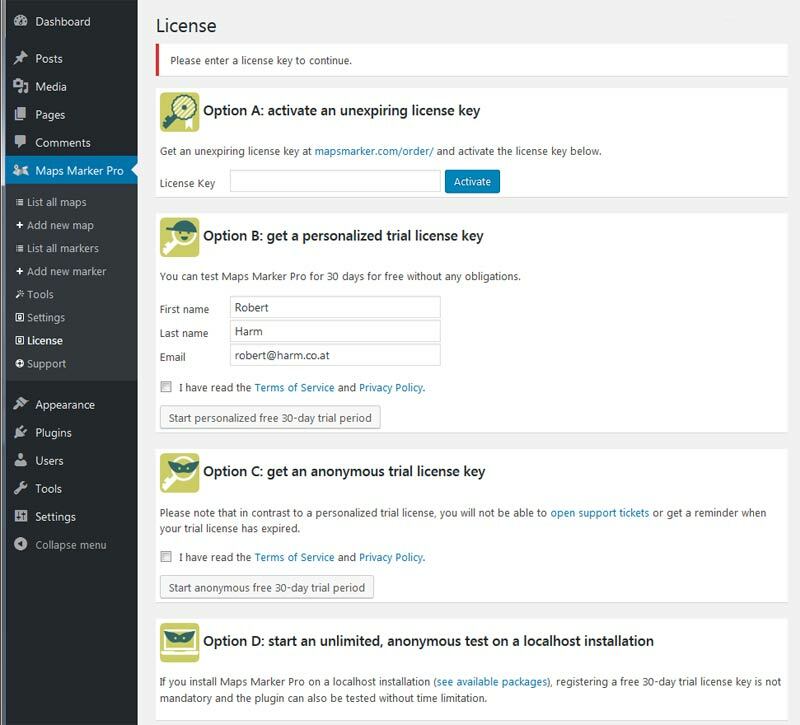 Your trial will also expire automatically unless you purchase a valid pro license key. Jump right in… Per default, all settings are prepared for you to start working right away. You’re free to customize everything, but you need to adjust nothing. As you dive deeper into Maps Marker Pro’s capabilities, you will uncover many customizable features to fit your project’s individual needs. Click here for a tutorial on how to verify the integrity of the plugin package (recommended if the plugin package was not downloaded from https://www.mapsmarker.com).